Tormenting others can be happy and exciting for many people. There are many ways in which people insult and hurt an individual’s feelings. Some people make use of verbal insults which can be aimed in a direct or indirect way; some choose facial expression to insult others, and some insult by action. When people insult you for your feelings it means that they are looking for some reaction from your side. Try to read through these helpful approaches which tell you how to respond to insults and hurts your feelings. I am sure, your answer would be YES. And not only you, almost everyone must have been undergone such a situation where you might have felt insulted or embarrassed. It can happen anywhere, in the family, in the workplace, in your neighbourhood etc. Insult is something where you are teased or people make fun of you. It is a state where you are treated ill and are disrespected. Now, this surely hurts and there are people who cannot take it easy. The one shot solution for this is to avoid such people and places. The solution which I have just provided is easy to implement, but that would only brace a coward in you which is more painful than the insult you experience. I would like to quote a line which suits this scene well “The best way to overcome your problem is to face it“. Dealing with an insult is a problem but believe me, there is always a solution to every problem. You just need to have the ability to identify it. Before moving towards overcoming insulting situations, let us look at what triggers people to insult someone. 4 Reasons – Why people Insult you? They find teasing playful and fun. Following mentioned are some crucial steps for how to reply to insults or tease and hurts your feelings. There aren’t individuals who insult or hurt you for no reason. Analyze what they want from you. Find out if they are trying to convey you something. Also, make a clear hunt if they are trying to make you stupid in front of others. They may insult you for a number of reasons so, analyze and find out the root cause. When you find the root cause then you can navigate and get to a solution. Take a look at the location where you’re insulted in order to make your next move. The person may have chosen a public place in order to bring down your social status. It would be good to react depending on the situation. If it is a public place make sure to get people to your side and make your team look stronger. If in a situation where you’re alone, there is never a need to present yourself as a weak one. Show yourself strong so that your bully would know that his words are not accepted. This is one best way to handle situations when you’re hurt or insulted. One way to respond to your bully is to react by asking questions such as “what’s wrong with you”? You can also ask him why he is so rude and mean, and what he requires from you. You can also tell him to mind his own business. By this way, they get back and think a number of times before they insult you. Instead of worrying or crying for being insulted, giving them back a right answer can shut their mouth. When someone insults or hurts your feelings the best way can be to walk away from the situation that happened. The one who hurts you would take it as encouragement if you continue to stand in their presence. The best way is to avert the situation by getting rid of it. Walk away in a casual manner and smile to your friends as usual by diverting your attention. The one who hurts you would be brought down this way. When you smile and away, it would be a great failure for one who insulted you. People who insult and hurt you are always waiting for chances to quarrel with you. They feel happy and a bit higher when they insult and hurt you. The best way to react is by changing the topic of discussion being done. Make your discussion in a way that he has no answer for the same. When you stand still or silent, the opponent has a good chance to hurt you more. Make sure to speak and divert the whole topic so that both of you are benefited. When people hurt or insult you on a regular basis, take help from your friends, get surrounded by your friends. A person may insult or hurt you when you’re alone when you’re in a gang, they may not try to hurt or insult you. Hence getting around with friends can be a good choice. The situation becomes strong and you get the winning points when you gather a team. 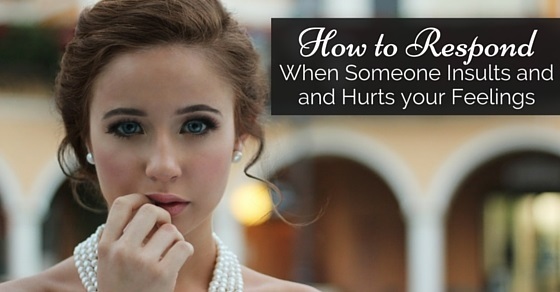 Another way to react to one who hurts you is by telling them in a polite way to respect others feelings and emotions. Make them understand that people are sensitive when various things are considered and to react as per an individual’s feelings. When someone hurts or insults you, there is no need to bother or get hurt because you know the fact that it’s not your fault. No one has the rights to abuse another individual verbally. Do not believe in what others say and get emotionally attached. If you’re a friend or colleague of that person, make a discussion with that person and tell him or her about how hurting his words are. Make them understand how it discomforts and makes others feel. There are people who do not know that their negative comments and words hurt others, so make them aware of others feelings. The one who hurts or insults you wanted to see you cry, get angry, and get hurt and so do not show your emotions in front of them. It is advisable to stay calm and neutral in such situations. The best way is to divert their thoughts and avoid them from taking control of your emotions. Verbal combats and arguments can only ignite them to insult or comment you more. Once you don’t react they may calm down. Take time to get back to normal once a person has hurt or insulted you. Healing yourself can be best done by counselling. It is one best way which can help you get out of the negative environment. One of the best and effective responses for ones who insult or hurt your feelings is by humour. Humour undermines what insult has been put forward, the tension that has prevailed is brought down and the audience are brought to one side. Whenever anyone hurts your feelings or insults you take the conversation into a humorous one. When a friend insults you look in a different perspective, do not bang up or spill out angry words as the situation may go worse. Be optimistic and handle the situation in a silent manner, when you are silent the opponent is the one who fails. From the way the opponent speaks, you can find out if it’s just a joke or intentional hurting. So stay calm and cool with patience as the best tool. When you’re continuously being insulted or hurt either in the workplace or in family background, do take initiative by seeking the help of a higher authoritative person or a senior. A higher authority can have the power and analyze the situation if the teaser is a troubled and often being complained by others, he may be warned. By this way, he would never hurt or insult any other person. When an individual is teased or hurt most innocent people do not react, but the one who do this must be taught a lesson. They must be teased back in a humorous manner in a cynical sarcasm manner. This would be indirect and make them feel. They will understand the pain and feel others undergo by their words when we return their insult. This can be one best way for gossipers to respond to ones who hurt them. Another best way to respond to hurting and insulting situations is by warning them. if you find someone who often whittles with the self-esteem of yours and belittle with you always make sure to create boundaries for such a person. Take initiatives and eradicate yourself from toxic energy. This is because your creativity is spoiled and you are pushed to depression. Hence making a bold decision and warning them once for all can be the best way to avoid them in future. This can be considered as the best way as they do not approach you in future too. How to Reply Back When Someone Insults You? The first thing you need to do when getting insulted or teased is to stay calm. The more you cry or get angry, the more will be the intensity of their teasing. Also, you need to understand one more thing, not everyone teases you to hurt you, it can also be the love for you or just for fun sake. How to Respond to Someone That Insults You? There is never a need to take offence for someone who has hurt our feelings or insulted us. It is also advisable for ones being hurt not to lose temper and get angry, anger actually deepens the situation. It is always a cynical sarcasm which leads to insults and hurting individuals and hence it is not good to encourage such gossips amongst friends or relatives. When you find someone who hurts you often and makes you feel it would be good to get rid of their relationship. Every individual needs patience and a smart way of thinking to handle such people. There are a number of situations in life where we meet insults and get hurt, reacting and fighting the battle is never a solution to handle those master hunters. Read through the pointers mentioned above and try to fight such situations in life.